....and with that little 3.32 mile trundle around the Embankment, marathon training officially ends. Between the 1st January this year, when my sixteen week training programme officially started and today, I have covered some 472.6 miles. As well as all the seemingly endless miles I've done around the river Trent and the Grantham and Nottingham canals, I've even found myself running up a ski hill in France as I attempted to keep putting miles into the bank whilst we were on holiday in March. I've smashed all my previous records: miles covered in a week, miles covered in a month, longest duration, most calories burned.... For a while, it seemed like I was doing my longest ever run every single week. I've topped out at 22 miles for now, but on Sunday, I will be smashing that record too as I line up on Blackheath Common for the 26.2 mile amble through London the the Mall. When I think that it was only a couple of years ago that I thought I would never be able to run further than six miles ever again, it all seems like a bit of a dream. It might sound trite, but it really does go to show what you can achieve if you put your mind to it. I still don't know if I'll successfully complete the marathon on Sunday - I guess I'm about to find out. What I do know is that I didn't think that my body would be able to withstand the rigours of marathon training, and it seems to have handled it all pretty well. In fact, although all that training sucked up an enormous amount of time and was a huge commitment, I've actually really enjoyed the longer runs. Even the really long ones. I think all runners have something of a masochistic streak, but it looks like I really, really enjoy flogging myself. I would never know that I could achieve any of that unless I had tried. Sorry to sound like a bad motivational speaker, but that goes for you too, by the way. Your target might not be a marathon, but there is something you can set your sights on... you know there is. We've also smashed our fundraising target, for which I can only thank you all. Your generosity continues to humble me and if I need to find any more motivation for running, it's your kindness and good wishes that will power me round on Sunday. There's still time to sponsor us too. CLICK HERE. The training is over, and now we just count down the time before we actually start running. In some ways, that's harder than just getting out and doing another run. You will be able to track our progress on the day on the London Marathon website or by downloading the app from the App Store. I'm runner number 11637 and C is 26096. 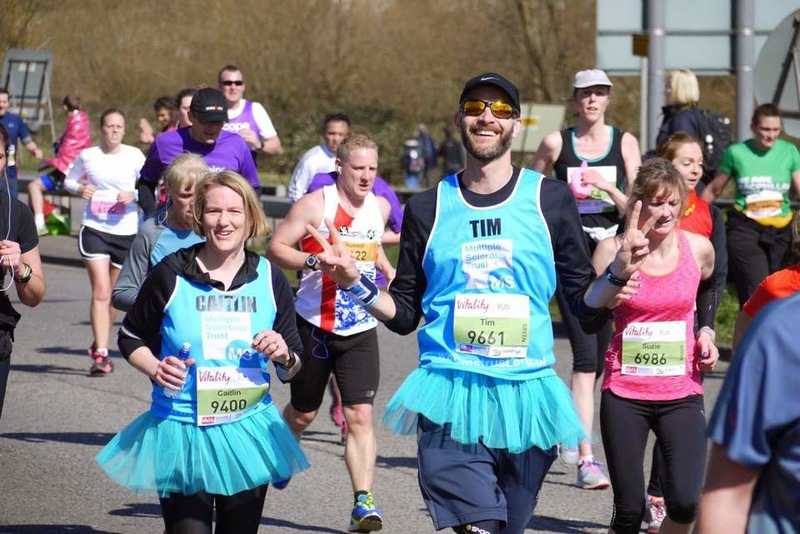 Alternatively, just look out for the blue tutus. good luck to you both - with our particularly crappy health condition, it's amazing how much effect having a proactive attitude can have.